Currently n Falcon if you go to the ‘Add new’ popdown you will see there is both ‘Collection’ and ‘Collection (old-style)’. 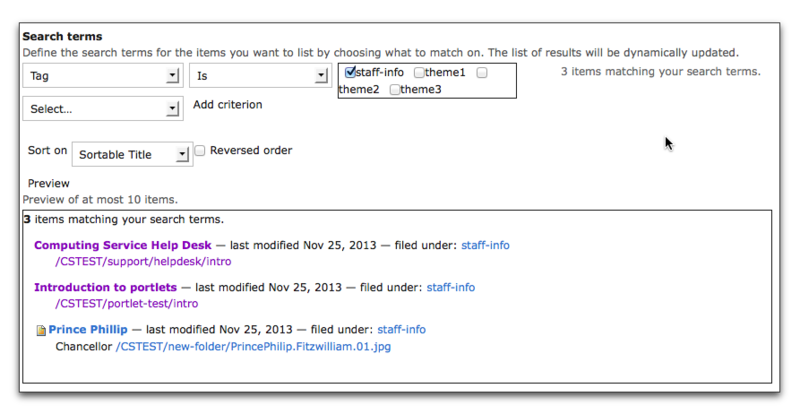 The first is the new version of collections and is what you ought to be using in your site: the second is required for the research directory, where the new type of collection will not work. You can add a collection at the top level of your site, in a folder or you can have a number of collections in a folder and have them in the left-hand navigation if you like. You need to be in the place in your site where you want the collection to be, go to the editing bar and select 'add new...' > collection. You then need to give the collection a short name and title. You have the opportunity of adding text, images, etc if you wish, in the ‘Body text’ field. The text, images etc. will appear on the page above the list of items collected together. 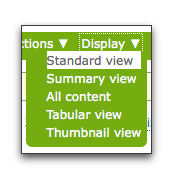 'Standard view' will be shown by default. 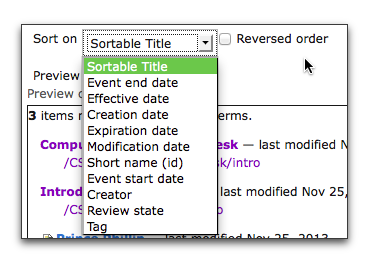 'Summary view' is best when you want to show titles with links, and the tabular view is ideal to show certain information. You may need to edit the collection again to show what you want in a table. 'Thumbnail' view is ideal to show a gallery of an image collection. Once you have set up at least part of a collection you will need to assess whether it’s giving you what you need. Taken in isolation, titles might not convey enough information and you may need to tweak them slightly. For some pages you might want to add summary information to give further details of what the page is about. If you are using a tabular view, you may want to look at what data can be presented. The a-z version of the academic staff directory on the page http://www.hist.cam.ac.uk/directory/academic-staff was created using collections. Within each person’s profile a tag was created for the first letter of their family name. The a-z bar was added to the body area of each collection and the links in the a-z bar were created to join all the collections together.